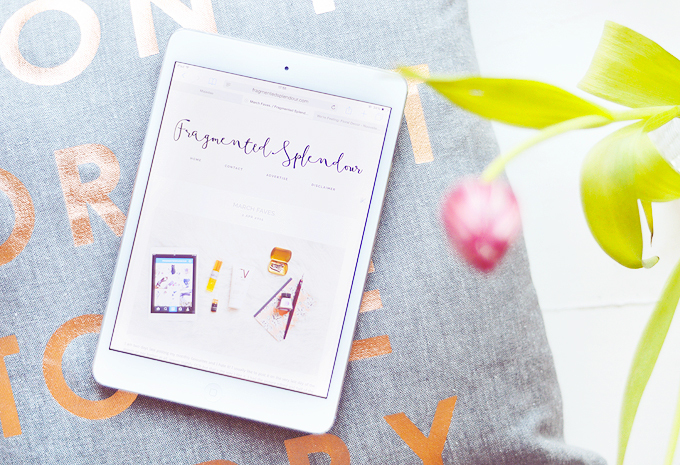 Apologies for my unintentional hiatus, but as you can see (unless you're reading this in a subscription feed or within the bloglovin' app) I've had a refresh with a completely new blog design! Huzzah! It's amazing what a new blog design can do for your blogging-mojo... ideas and motivation can become stale if you're staring at the same canvas 24/7 and a little change is always a good thing for our online spaces. I'm so happy with my new design & hope you love it too. The online slider on the homepage gives you a glance of my content straight away whilst looking super snazzy and I've decided to add a 'read more' feature for each post to keep the main page looking clean and tidy. I know a lot of people hate to click 'read more' but seeing as so many people read from bloglovin or click directly to the post from a twitter link it really shouldn't affect you too much. The design is also completely responsive and looks beautiful on tablets and mobiles now. It looks a little different to how it looks on a desktop and the sidebar is below so that your reading experience isn't ruined with having to zoom and move the page around to read. Incase you're wondering I purchased my design from Maira Gall & I would highly recommend her shop! I've purchased a template from her before & she's just so helpful if you have any problems or questions. If you're looking for a new layout I also did a little roundup of my favourite designs (under £20!) on Nouvelle recently, too. I have one or two more things to tweak and then I will be 100% happy! Please let me know if you notice any kinks or problems and I will get straight to fixing them!